Intensity 10 with Single Flowmeter and Oxygen Monitor - SHIPS FREE! 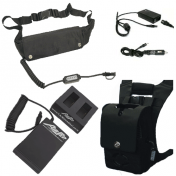 Intensity 10 with Dual Flowmeters and Oxygen Monitor - SHIPS FREE! 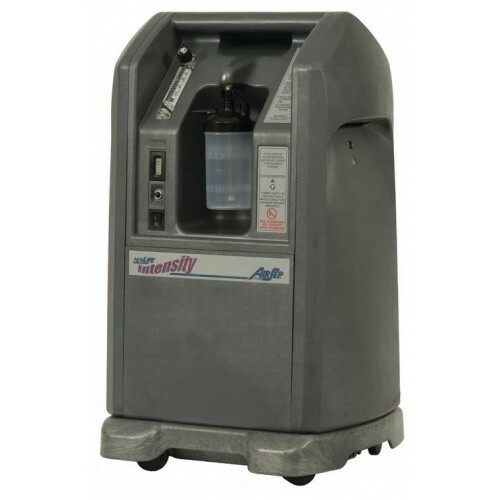 Airsep NewLife Intensity 10 Oxygen Concentrator is a high flow oxygen concentrator that delivers up to 10 LPM of continuous oxygen. 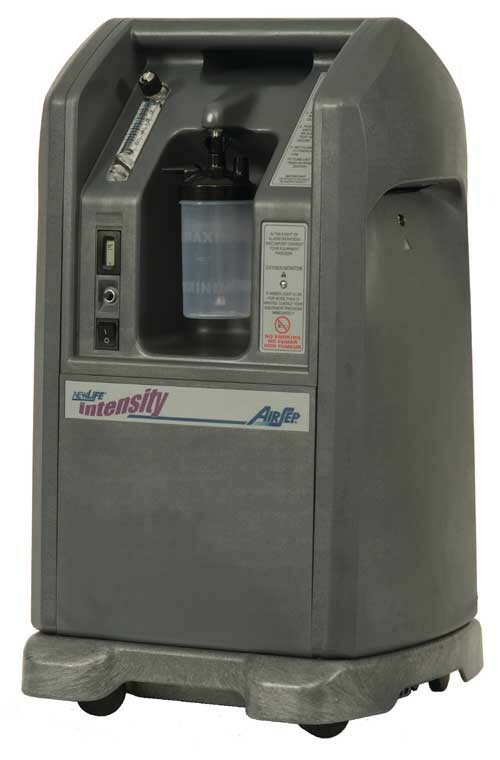 The Airsep Intensity 10 also has a high pressure capacity of 20 psig, which is approximately three times higher than most oxygen concentrators. 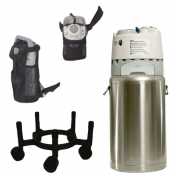 High pressure and high flow oxygen combine to add more utility to the Intensity Oxygen Concentrator. 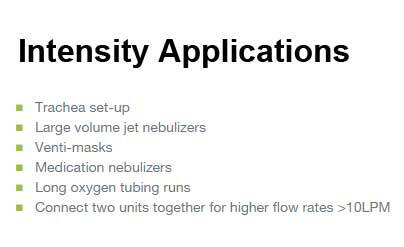 For instance, the Intensity Concentrator can provide oxygen for large volume jet nebulizers, venti-masks, medication nebulizers, long oxygen tubing or dual flow. The Intensity Concentrator can administer humidified oxygen to a trach patient by connecting a jet neb bottle to the O2 outlet on the concentrator. The concentrator offers Oxygen Patients more flexibility in special applications that most concentrators are not designed to accomplish. Manufactured by AirSep, the concentrator is also available as an 8 Liter Concentrator. They also offers other Home Oxygen Concentrators including the smaller 5 Liter Oxygen Concentrator called the VisionAire 5 as well as Portable Oxygen Concentrators such as the eQuinox. Concentrator with Single Flowmeter - provides oxygen for one patient. Concentrator with Single Flowmeter and Oxygen Monitor. Concentrator with Dual Flowmeters - provides oxygen for two patients simultaneously. Concentrator with Dual Flowmeters and Oxygen Monitor. 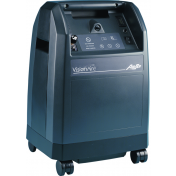 The Airsep Intensity Concentrator series offers a choice between single or dual flow oxygen concentrator service. A dual flow concentrator allows two patients to be served from the same oxygen concentrator, providing reduced power consumption and fewer oxygen concentrator purchases. Take advantage of the massive savings of a single unit for two patients! The concentrator provides 10 LPM output that is regulated on two separate flow meters. One flow meter can output 5 liters and the other can also output 5 liters or less. Or one flow meter can be set to 3 liters and the other at 7 liters. The maximum combination between the two flow meters is 10 LPM which is the concentrators maximum output. The PSI, though, is never split; if the flow is spilt, both sides will deliver at 20 PSI. 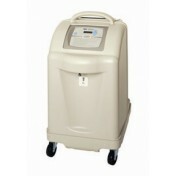 This machine is a stationary oxygen concentrator that may be used for homecare as will as clinical applications. The AirSep NewLife Intensity concentrator can also provide low flow meter blocks to serve pediatric applications. An optional oxygen monitor is available to determine the actual oxygen output of the Intensity at any given instance, helpful for those on a specified prescription dose or those living at higher altitudes. Power-efficient, saving you electric expenses. Single or dual flow options. Low flowmeter blocks for pediatric or other low flow applications. Optional oxygen monitor to verify concentration. 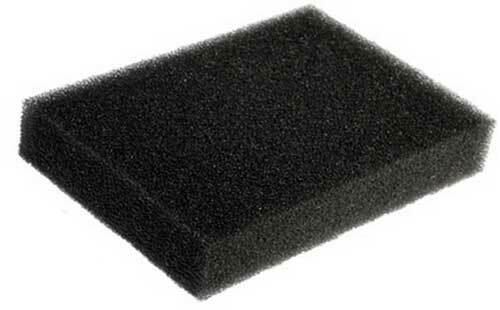 Product Numbers: AS099-1, AS099-4, AS099-100, AS099-101. Maximum Outlet Pressure: 20 PSIG. 10 LPM 87% - 93%. Maximum Operating Altitude: 0 – 10,000 feet above sea level. Alarms: Battery test, high temperature, power failure, high pressure, low pressure, and low concentration with optional oxygen monitor. Certified Oxygen Concentrator Specialist - Questions about the AirLife Intensity 10 Liter Concentrator or any of the other oxygen concentrators can be answered by one of our Certified Oxygen Concentrator Specialist. These trained specialist are trained, tested and re-evaluated every six months to ensure they are on top of the latest technology and the newest oxygen therapy delivery devices. These certified specialist can help you with questions about pulse flow oxygen, continuous flow oxygen, oxygen concentration levels, high altitude operation, oxygen therapy while traveling, as well as questions about specific concentrator specifications. Call toll free to 800-397-5899 to reach one of our Certified Oxygen Concentrator Specialist. 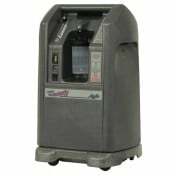 VM Rental Program - If you would like to "kick the tires" by trying out a particular concentrator before actually purchasing it, try our rental program. Vitality Medical rents by the week with no limitation on the number of weeks. Try before you buy and take all the time you need to test, try and learn how to use one of the leading edge portable oxygen concentrators on the market. Often oxygen patients want to take a portable oxygen concentrator with them while traveling since home oxygen concentrators are too bulky and do not work with many foreign power grids. Vitality Medical has several lightweight portables approved by the FAA for airline travel that can be operated 24/7 while on your vacation. Call today for details at 800-397-5899. Vitality Medical Buy Back Program - Not 100% satisfied with the concentrator you purchased? Let us make it right! Vitality Medical will buy your concentrator back and help you determine a better fit. Oxygen Concentrator Loaner Program - Should your concentrator need to be repaired, Vitality Medical provides a concentrator on-loan for you to use while your concentrator is repaired. Whether your concentrator is under warranty or not, our customers have access to the Vitality Medical Loaner Program. Easy Warranty Processing - If your oxygen concentrator requires repair while under warranty, just give us a call on our toll free line to set up your warranty repair at 800-397-5899. Remember, Vitality Medical offers a free loaner while your concentrator is being repaired. Warranty processing is only for concentrators purchased from Vitality Medical. Oxygen Concentrator Rankings and Comparison Charts -A list of the top ranking oxygen concentrator choices along with detailed reviews, concentrator rankings and side-by-side comparisons, are available by clicking on the links to our oxygen comparison studies below. 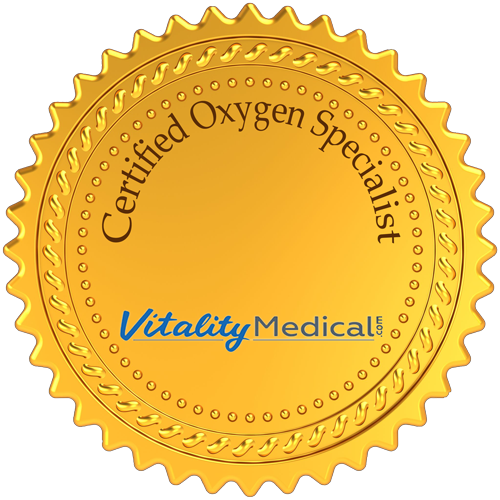 Oxygen Concentrator Expertise from Vitality Medical Certified Oxygen Experts. Comparison Chart of the Top 5 Liter Oxygen Concentrators displays oxygen performance, size, weight, operating factors and dependability. 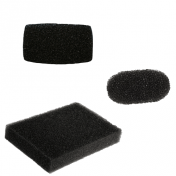 Filters manufactured by Chart Industries. 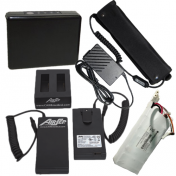 Accessories and Replacement Parts including batteries, backpacks and power supplies. Case R, Hausmann R. Use of a portable oxygen concentrator with a fixed minute volume oxygen conserving device to deliver oxygen to exercising pulmonary rehabilitation patients (abstract). Respir Care 2005;50(11):1510. 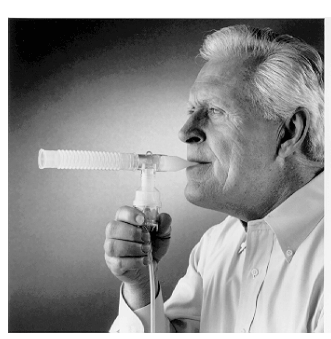 McCoy R, Petty T, Gay P. Respironics white paper. 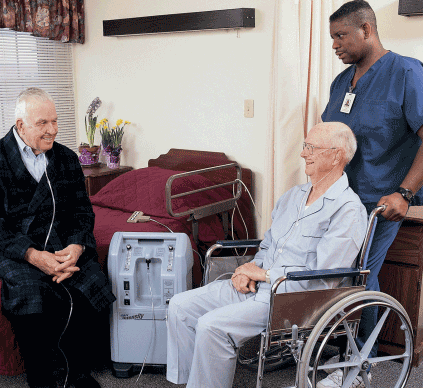 Comparison of three portable oxygen concentrators on exercising patients. Andover, MA: Philips Respironics; 2008. Chatburn RL, Williams TJ. Performance comparison of 4 portable oxygen concentrators. Respir Care 2010;55(4):433–442. Leblanc CJ, Lavallée LG, King JA, Taylor-Sussex RE, Woolnough A, McKim DA. 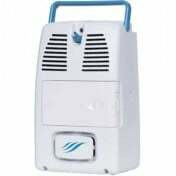 A comparative study of 3 portable oxygen concentrators during a 6-minute walk test in patients with chronic lung disease. Respir Care. 2013 Oct;58(10):1598-605. doi: 10.4187/respcare.02275. Epub 2013 Apr 2. Petty TL, Bliss PL. Ambulatory oxygen therapy, exercise, and survival with advanced chronic obstructive pulmonary disease (the Nocturnal Oxygen Therapy Trial revisited). Respir Care 2000;45(2):204–211. O'Donnell DE, Hernandez P, Kaplan A, Aaron S, Bourbeau J, Marciniuk D, et al. Canadian Thoracic Society recommendations for management of chronic obstructive pulmonary disease - 2008 update - highlights for primary care. Can Respir J 2008;15(Suppl A):1A–8A. Nasilowski J, Przybylowski T, Zielinski J, Chazan R. Comparing supplementary oxygen benefits from a portable oxygen concentrator and a liquid oxygen portable device during a walk test in COPD patients on long-term oxygen therapy. Respir Med 2008;102(7):1021–1025. Hi. My name is Julie Hanson, Clinical Education and Quality Assurance Manager at Independence Plus. 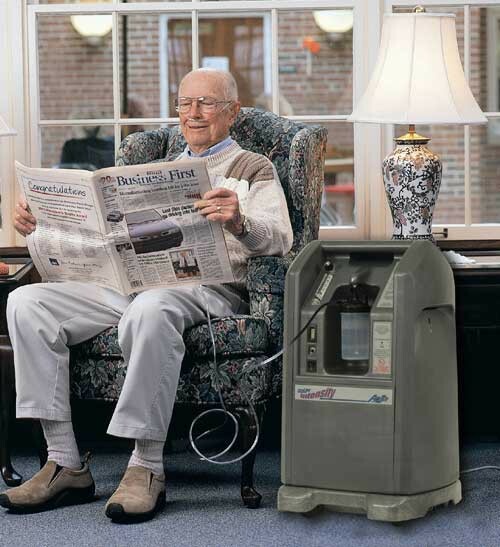 Today, I am going to give you a brief introduction to the Dual Chamber Oxygen Concentrator. Charlie is receiving oxygen through an oxygen concentrator. Always make sure your concentrator is on. If you want the oxygen flowing out of this port, please ensure that this dial is up. If you want the oxygen to flow out of this port, turn this dial off, and open this port. Now the oxygen is flowing out of this port. Always remember to follow your lines. If you want oxygen coming out of this port, make sure this flow meter is up. If you want oxygen coming out this port, ensure this flow meter is off and this flow meter is on. When you are done using the oxygen concentrator, turn both flow meters off and turn off your oxygen concentrator. This was a brief introduction to the Dual Chamber Oxygen Concentrator. NewLife Intensity Brochure shares the features and benefits of this AirSep Home Oxygen Concentrator. NewLife Intensity Patient Manual provides operating instructions and maintenance information in English. AirSep NewLife Intensity Oxygen Concentrator Patient Manual offers instructions for correctly operating your concentrator in French, German, Spanish, Greek, Italian, Dutch, Portuguese, Swedish and Danish. NewLife Intensity Concentrator Nebulizer Function details the use of your oxygen concentrator for nebulization. NewLife Intensity Dual Flow and Pediatric Flow offers instruction for using your concentrator for two people or for pediatric applications. 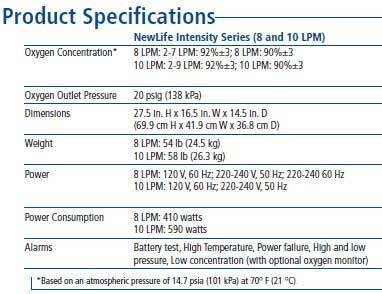 NewLife Intensity TroubleShooting Guide provides chart with list of possible problems, cause and solution. Long Term Oxygen Therapy Study by the Ottawa Hospital. Smoking Risks and Medical Oxygen offers information to reduce the risks of fires and burns when smoking and using oxygen. 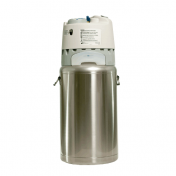 AirSep Warranty provides details and warranty period schedule for AirSep Oxygen Concentrators. What would be the longest oxygen tubing run using the Airsep Newlife 10 Liter unit? We have various lengths of tubing that will fit this style of concentrator, including those up to 50 feet in length. What is the decibal reading on this machine ? This concentrator puts out 57 decibels while in operation. Is the AirSep NewLife Intensity 10 Oxygen Concentrator available for financing? We have financing options available through our checkout page. Under the payment section, simply choose the "Get Financing" button and follow the steps. You'll be set up in just a few minutes. This concentrator is exactly what I needed and it works very well. It is very quiet so it would be very easy to sleep while it's running. If there is anything I'd change about it, it would be to be able to turn the test alarm off that comes on Everytime you turn the machine on because it is very loud but it only alarms for a few seconds then doesn't come on again unless there is an issue or the next time you turn the machine on. Anyone reading this review, the test alarm is normal. It's not an issue with this concentrator.